Everybody seems to know it. It grows everywhere. Bitter-leaf, vernonia amydalina, is a very homely plant. Wherever it grows, it flourishes. Evergreen. The Igbos call it Onugbu. The Yorubas call it Ewuro. The Hausas call it Shiwaka. Perhaps the most distinctive part of the Bitter-leaf plant is its bitterness. Every part of the plant is bitter: the leaves, stems, root, and bark. The Igbos of Eastern Nigeria use the bitter-leaf mostly as a vegetable, while the Yorubas use it more as a medicine. Bitter-leaf is popular among the old people for its bitterness. But the young people of today do not like the bitterness of the bitter-leaf. They would rather prefer biscuits, ice cream, chocolate and other sugary products. Their philosophy is 'Life is sweet, therefore, food must be sweet. The fact is that bitter herbs are good for the body. On the existential level, they remind us that life is not always sweet; that life is not bed of roses; that both sweetness and bitterness are essential parts of life and soar not opposed. Bitter herbs help to tone the vital organs of the body, especially the liver and kidney. The liver is the largest organ of the body. It weights between 1-3 kg in the adult. Its major funtions are (a) secretion of bile and (b) formation of glycogen. The liver is essential in the metabolism of fats and protein, it must therefore be well taken care of. Once the liver has any defect, it is hard to correct. Every effort must be made therefore to keep the liver in good condition. Alcohol, sugar and processed or refined foods can weaken the liver and make it susceptible to infections. The kidney is another important organ in the body. The kidney is the organ that helps to expel waste materials from the body. It secretes urine that flows into the urethras. If the kidney breaks down, there will be a general disorder in the body. Bitter-leaf is very useful in the care of the kidney and the liver. It is for this reason that we refer to bitter leaf as a cure all, for if the kidney and the liver are healthy, the whole system will function well. The bitter leaf plant contains Vernodalin, Venomygdin and saponin. Bitter leaves should always be taken fresh. Boiling or cooking reduces the potency of most herbs. The Igbo people of Eastern Nigeria eat a lot of bitter leaf. But they often squeeze out the bitterness from the leaves before eating it. What left then, is a mere chaff, with little or no medicinal value. Always remember that raw vegetables are better than cooked ones. And half-cooked vegetables are better than over-cooked ones. Bitter leaf, like other plants, is a sacred plant. Therefore, respect it and pray over the plant before you use it. We need to cultivate an attitude of reverence for God's creatures so that we can be in harmony with them. The following are some of the many uses of bitter leaf. Chew the tender stem of the plant like a chewing stick and swallow the bitterness. This is a well known remedy for stomachaches. In some cases the ache stops within a few minutes. An alternative is to pound the fresh leaves in a mortar and press out the juice. Add a pinch of salt to three tablespoons of the undiluted juice and drink. This brings immediate relief. 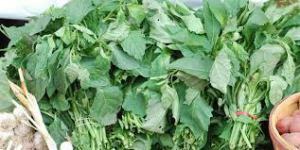 For skin infections such as ring worm, itching, rashes and eczema, the pure undiluted extract of bitter leaf is excellent. Simply apply it to the affected part daily. Diabetes should listen carefully to this good news. They do not need to despair or lose hope. God has not abandoned them. God has given them bitter leaf as a sign of God’s lovw and care. From time immemorial, herbalists have been using the bitter leaf plant for the treatment of diabetes. Bitter leaf not only reduces the sugar-level drastically, it also helps to repair the pancreas. Squeeze ten handfuls of fresh leaves in ten litres of water and take two glasses thrice daily for one month, this amounts to six glasses daily. Prostrate cancer is common among menover forty years old. It sysmptom is difficult and painful urination, among others. Bitter leaf is very good for this ailment. It increases the flow of urine and reduces the pain, as well as regulates the spread of the cell. Simply squeeze the fresh leave in water and take a glassful four times daily. Don’t be surprised if you begin to urinate very frequently when you take the bitter leaf extract. It’s part of the cleansing and healing process that your body needs. Do you often feel weak and tired? Do you lack vitality and vigour? Then get up and take a walk into the bush. You don’t need to trek far before you find a bitter leaf plant. Squeeze the leaves in water and take a glass thrice daily. Soon you will experience a new lease of energy. Bitter leaf solution calms the nerves, strengthens the muscles and cleanses the system. I have seen what marvels bitter leaf extract has done for many people and I testify that it is good. Squeeze the fresh leaves of the plant in water. Take a glassfull thrice daily. Warm the solution on fire each time before drinking. Remember, do not boil, just warm. Continye the medication for a month. You do not need to squeeze the leaves each time you want to drink it. Yoy can squeeze a large quantity at once and add some honey. This will preserve the solution. However, note that if you store bitter leaf extract for twenty-four hours or more, the bitterness will disappear or diminish. Arthritis or rheumatism patients who have tried bitter-leaf solution as described above attest to its effectiveness. It soothes inflamed joints and eradicates the pain. Like Nature Power page, comment and share post. Provoke one another unto love.